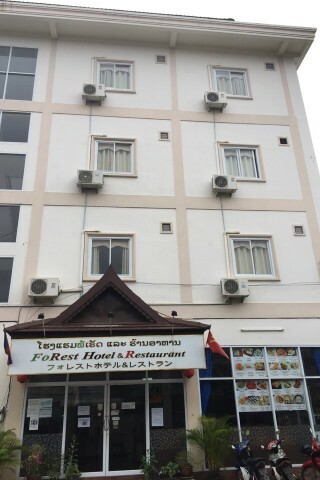 Set in a four storey building in the tourist centre near Pakse Hotel and the central market, FoRest Hotel is an unusual combination of backpacker and flashpacker accommodation and Japanese restaurant. Ad Book now! Rates from US$21++. Average rating 7.6 from 133 reviews. Backpackers can look forward to a dorm room with solid wood bunks. Four bunks/eight beds fill up most of the room making it a bit of a tight squeeze. Nang Noi Guesthouse dorms are cheaper but are fan only while FoRest Hotel’s dorms are air-con. The private rooms are like a Japanese Hotel circa 1980. Furniture is a dated mix and match, and one room we saw had an L-shaped desk with office chair, more befitting of an office cubicle than a hotel room. However, everything is functional and clean, with air-con, bedside plug, fan, mirror, fridge, box TV, kettle and tile bathroom with a separate shower area and shower curtain. Like most Pakse hotels, the private rooms are slightly overpriced. On the upside, it does come with a Japanese-style breakfast set, WiFi and one-time free laundry included. Staff are also eager to please though English is limited. FoRest Hotel is located a block from the Central Market, Monument Books and Sinouk Cafe, an easy walk to Route 13. Last updated on 19th March, 2017. Check rates at FoRest Hotel on Booking.com. 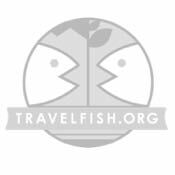 A selection of some of our favourite sights and activities around Pakse. Where are you planning on heading to after Pakse? Here are some spots commonly visited from here, or click here to see a full destination list for Laos.